The 2017 Marian Procession. Photo: John McLaurin. 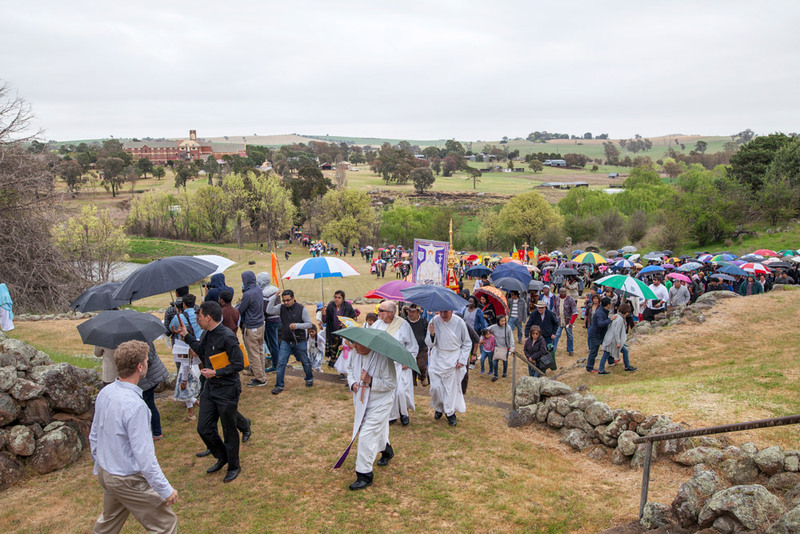 Over many decades, the Marian Procession has gathered tens of thousands of Catholics from across Australia. Now held during the beautiful spring month of October, the Marian Procession and Youth Pilgrimage offers a wonderful family day of prayer, feasting and celebration. In 2018, St Clement’s Monastery, Galong will be celebrating 100 years since its founding and opening Mass. As with the first Mass, in 1918, we too will have the Apostolic Nuncio present. This year it will be Archbishop Yllana as Celebrant. During the day there will be a youth pilgrimage, the opportunity for Mass, the Sacrament of Confession, to pray the rosary, a procession to the grotto and to be inspired by the speakers. It is a multicultural family day of festivities, where local Parishes, ethnic communities, clergy and religious take time to enjoy one another and journey with Mary to Jesus. Youth – come and join in an hour long Youth Pilgrimage walk that travels from Galong Village to St Clement’s. We would love for members of EVERY Parish, EVERY community and EVERY school to be represented at our Marian Procession. BYO food and umbrellas or you may purchase a bbq there.